17 Rue Meldrum, Beau Bassin, 1713-01 Mauritius. Printed in U.S.A, U.K and Germany. It is surprising that so few books chart the dynamic progress of one of India’s most charismatic cricketers and captains. In due course, I am sure that more will appear but, for the time being, it is good to see this production, which details not just Dhoni but other aspects of world cricket, come onto the market. Somewhat bizarrely, this account of this most charming of Indian cricketers was published in Germany and, whilst admittedly not cheap, at least gives an updated account of Mahendra Singh Dhoni’s career until the middle of 2011. It is also a series of articles from Wikipedia which, as the publishers state, they cannot guarantee the validity of the information but, nonetheless, I am personally delighted to see this book on Dhoni appear. It would have to be said that a lot of the Wikipedia excerpts relate more generally to the game of cricket and, within these excerpts, Dhoni is mentioned in some capacity through either deed or by photograph. It is, though, a useful guide to anyone not particularly familiar with either the game or its nuances. 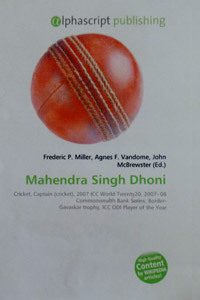 The 2007 ICC World Twenty20 tournament in which Dhoni captained India to victory is given a good mention. This result might have been the start of far-reaching events for both Dhoni personally and Indian cricket. It was very early in his captaincy career and the coolness which has become his hallmark was there for all to see and India, at that stage, not the most adept or enthusiastic participants of the game’s shortest version found themselves beating Pakistan in the final and it wasn’t long before the world became familiar with the Indian Premier League. Other Test and ODI series are mentioned in detail as are ICC awards which Dhoni features in regularly. One article with which readers are less likely to be familiar is the list of Rajiv Gandhi Khel Ratna awardees which is given as highest honour for achievement in sports. Since its inception in 1991-92, only two cricketers have been awarded this honour: Sachin Tendulkar and Dhoni. Whilst some of the articles only mention Dhoni and are of a more general nature, readers should learn a lot more about Mahendra Singh Dhoni in the first chapter. The statistics are impressive as is the write-up in which readers will learn how Dhoni came through the ranks from one of India’s lesser known states. Dhoni is an icon to many and one wonders how much good he might bring to the state of Bihar/Jharkand. More recently, the results have not been as good for India overseas but, whilst the statistics may make for impressive reading, that does not tell the entire story of M.S.Dhoni. His innovative captaincy – regularly opening the bowling in a Test with a spinner and becoming the first named wicketkeeper to bowl in both innings of a Test after an injury to Zaheer Khan – and his impressive demeanour on and off the field and as a person make him a most interesting subject and one which you would expect to read much more about in years to come. This book, although not solely about Mahendra Singh Dhoni, should give readers more of an insight into this gentleman cricketer as well as giving more information on the world of cricket.